An old idea, building from balsa! Doing a little research into laser cut kits I started with my admittedly favorite choice - Mountain Models. The first thought was for the "Switchback Spot", a 4-channel low-wing plane featuring some dihedral and a flat wing bottom. The span is 35". The low wing loading which makes it a very forgiving flier. For those who want more adventure the plane can be purchased as the "Switchback GT". It's the same fuselage, but the wing is flat (no dihedral) and is symmetrical. Span is reduced to 31.5". This change turns the Switchback into a more advanced flier. MM sells the wings separately so a builder could start with the Sport wing and upgrade to the GT wing. I own both wings and usually fly the Sport version as I have another of their planes that gives me the spice found on the GT wing. The Switchback has been around for years and has an extremely loyal base of builders on RC Groups. Mountain Models is based in Wisconsin (formerly Colorado, which explains the company name) and is a small business that provides fantastic quality in their kits. These are some of the more complete kits on the market including pushrods, wheels, pushrod connectors, etc as needed. They're not the cheapest on the market, but the quality and the extra parts included make up for that. Heck, the quality of their cutting alone compared to the other kits I've built would make it worth the extra few dollars. Build a balsa kit from Hobby King and you'll know exactly what I mean. So I started by thinking about the Switchback, but then looked at some other options they have and think the Dandy might be a better choice. Much worse name, however... The Dandy is very similar to the Switchback in that you can get the Sport or GT versions. In fact, the wings are exactly the same as those on the Switchback but have the aileron servo on the top instead of the bottom of the wing as it's a high-wing plane with easier to build tail-surfaces. Also, there is a third wing option for the Dandy which doesn't offer ailerons. This wing is longer at 47", giving you a plane similar to a glider. So either of these planes could provide a lot of flexibility for builders allowing them to start with an easy flier and then progress to something more "spicy". Power requirements are minimal. I'm currently using the Hobby King AX2308N 1100kv motor, generic 9 gram servos, a 9x5 prop, and an 18-20A ESC. A 1000mAh battery fits perfectly. Covering film is strongly recommended to be light-weight. I used the So-Lite covering that MM sells and found it works very well. Anybody want to make an argument for a different plane feel free to do so. I'm not sure yet if the main idea on this would be that everybody is building the same basic plane or if everybody is simply building a somewhat basic and easy to build as a way to get their feet wet. If everybody had a similar plane it would help answer questions as they came up, but the "chosen design" may not appeal to everybody. I'm leaning heavy towards the original Dandy without ailerons, since I've already built both of the other wings for my Switchback. There is something appealing to me about the old-school 3-channel look. I almost ordered a MiniFlash back in March and asked about it on RC Groups, but I was told "I would choose the EVA over the MiniFlash. It is a later and better design, IMHO". Normally that kind of remark is just opinion, but considering this is from "CoClimber" (the guy who actually designed the MiniFlash, steering me away from his own design!) I figure his opinion couldn't be beat. The EVA is $14.00 more, but you can order the Sport or 3D wing at that price or for a little more you can order it as a bi-plane kit. As with the Switchback and Dandy you can also order any of the wings to go with the fuselage. The MiniFlash doesn't seem to have been in-stock since March, so maybe they've discontinued it but haven't removed it from the website...? I've dealt with Brian at Mountain Models a few times, and he has been a good guy to work with. If this whole thing takes off and a number of people agree to it, I'll talk to him again and see if we can work out some kind of discount. I would love to watch a balsa build series. I doubt that I would do my own build along side, but it would certainly be useful if I ever get into the "deep end" of the hobby. I'm twisting your arm, if you were wondering what that pain was from. I sent MM an e-mail to see if they are interested in putting some kind of group buy together. No specifics, just interest in general. It may hinge on quantity, time, or whatever, but we'll see what happens. While I think this would work and would be fun (and educational) I really think that having anybody from the FliteTest crew involved would get the best results. Heck, how many people just go to the website to watch the videos and don't even know about the forum? Fingers are crossed that this gets their attention and they find the endeavor worthy. I really like your idea! 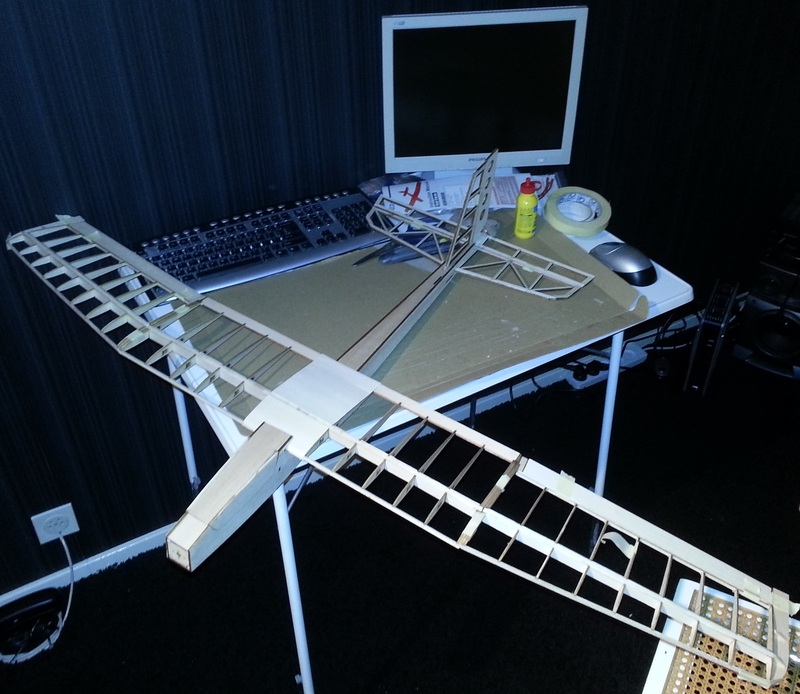 I almost finished my Red Swan Laser Cut Balsa KIT 1250mm. And after that I'm looking forward for an new project. Because I really liked building and experimenting with this kit and overall with balsa. Unfortunately this Dandy kit is not available at my current location. Thats why I planning on going for something like this: Big Stick Laser Cut Balsa Kit 1060mm (Kit) Because this plane is very identical to the dandy. And is available at my location as were we spoke about on RC-Groups. I 've added an picture of my Red Swan, its not completely build because currently the wiglets are taped to the center wing since the glue need to be hardened before I can continue. Its only for illustration purposes. Looks good! I'm still waiting on HK to ship my Swan and BeeGee...so it's going to be awhile. Dang it! I have to get back on my ASW-15 build! I like the looks of the ASW-15 - maybe some day I'll have to add one to the fleet. Although a Bird of Time kit is also calling my name. Hopefully the smaller version that Hobby King sells, the Sunbird, will quench that thirst as the real BoT is pretty darn big and I don't know if I have room to fly or land it! Timeless, I've seen some video of the Big Stick from HK flying and it looks like a pretty good kit. The price is hard to beat for their stuff and you're already one step ahead having experienced the Chinese "quality" laser cutting...! ...Although a Bird of Time kit is also calling my name. Hopefully the smaller version that Hobby King sells, the Sunbird, will quench that thirst as the real BoT is pretty darn big and I don't know if I have room to fly or land it! The Sunbird is also a nice looking plane. Maybe there is an option to split the wing using a carbon tube. so it can be transported more easy. Someone from the RC Groups community even made an instruction/build video of the Big Stick: Video. This can definitely help people out I believe. I don't think the instructions have any information on splitting the wing, but it shouldn't be too hard to do. Even though I drive a bigger vehicle I may need to look at doing that as the wing might be too long to fit in the back end safely. The Red Swan wing is a little awkward at times due to the dihedral, but it is a bit shorter than the Sunbird. Just more things to consider before building! I'll have to start a list so I don't forget once building starts. I guess I am luckier than most in this regard. My main flying field is out my back door. There is no runway, so no RoG and only belly landings but it's close and convenient! For any other flying locations, I have a tonneau cover on the carpeted bed of my truck so wing size isn't an issue until I have something over 8' (which I don't). Nice! My local park is only a few miles away and I can easily carry any of my planes in the Grand Cherokee - occasionally I can wedge 5 or 6 in there for some variety while flying. Some day I'll have to build a Tri or Quad Copter so I can sit in the back yard and fly. I just checked, still waiting for HK to post my laser kits...they haven't even mailed them yet!! FYI to anybody looking at the Mountain Models kits for a build coming up, a lot of their kits are on sale right now including the Dandy I plan on building. They also just released a 36" span 3 channel motorized glider which looks nice as well. I'm ordering the Dandy next week since I told my wife I wouldn't order any more planes for a few days. It is about $7.50 off the regular price so that will pay for most of the shipping. Yay for more toys! Well, that may be easier said than done...I got to sit home this week waiting on parts for work to finish a priority job and I just found out there is no pay for the wait on this one...! Grrr! So, I might have to just build the Red Swan as my contribution. I did get some good news though! Both my recent orders to HK are in the states now! Hit on the same day even though one order was placed a week before the other, guess who the shipper was on the week older package...Singapore post! I don't know why it was shipped with them as I make it a policy never to select shipping with them for this very reason. Oh well, I'll get an update as soon as I can. You have plenty of time, I don't expect to kick things off for a month or two at least.